It is all happening again! My personal collection of madness hamsters have been nibbling on my brain again too much recently. The weird little critters that invade at 3am and whisper things like “you’re not a corporate person” or “what’s the point in having a salary if you have no time to enjoy it?” Or “you’re too creative for a 9-5” and “the more bored you get, the more we will steal your brain” and so on. They are annoying. I also tend to think they are right. I don’t want the hamsters to steal my brain, but I was resigned to what I tried to convince myself was a sensible option – working a secure, decently paid and non-stressful (but BORING) job for a number of years in order to save up enough money to start my coffee shop again properly, and also to sort out my permanent residency status in Canada and build up a good credit rating and just not rush headlong into enormous financial risk, ill-prepared. I started Wheelie Good Coffee as a sort of trial run, to keep me amused and still Coffee-ing, and to keep the hamsters at bay. The trouble is, Wheelie Good Coffee has been very successful, and I now want more. I also lack the patience for the Sensible option. I hazarded a guess depending on location – turns out I was pretty close! The short version of events is that Matt is a graduate of the UofR business school, and very interested in entrepreneurship, but has never yet had the opportunity to actually start a business of his own. Conversely, I have started quite a few businesses now but with no official schooling in business besides trial and error. More significantly, my newcomer status and lack of capital means I have no way of funding a new start up. Matt does not have these problems, neither does he have huge bills like humungous town house rent or childcare to contend with. So, he applied for the funding. We then scouted round for a building, and after a lot of disappointments and frustration, I found a near-perfect one – via a chance conversation with a stranger on Twitter. 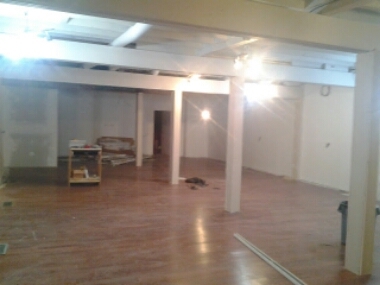 After negotiating the lease with the landlord who I just happened to have made coffee for a few years ago at 13th Ave Coffee House, a lot of phoning around got us a general contractor to turn a huge empty space into a pleasant social space with two bathrooms and a coffee bar. I rallied the troups and got Bill to agree to roast the coffee for us, and got the tea supplier sorted, and chose an Orange espresso machine whilst avoiding the standard sales pitch since I already new what I wanted. Another brief plea for interest on Twitter has landed us some excellent local food suppliers too, and further chance meetings have lead to potential other vendors coming on board as well (BOOKS!! YAY!! ), all with a local theme. And yesterday, Matt and I signed our lives away by incorporating the company as set up by a lawyer who Matt used to play hockey with. We are now Dr Coffee’s Cafe Ltd, and as such, Matt no longer bears the entirety of the financial risk. And neither do I. The huge and still empty space! Getting this all together inside 6 weeks has only been possible because Regina is a small and very friendly town, and vague but useful connections are very easy to come by (and I like talking to people). 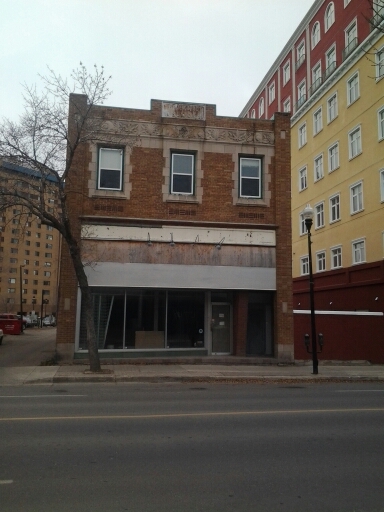 But that does beg the question, does a small place like Regina actually need another coffee shop? Of course I’m going to say yes, because this is a passion project, and I don’t know the meaning of Too Much Coffee. But in all seriousness, I do believe Regina can support another cafe downtown or in Cathedral. Cathedral is down to one solo coffee shop which isn’t much to write home about. There is nowhere within a comfy walking distance that does coffee anything like as good as Roca Jack’s used to, and annoyingly few places that we can go that are comfortable with small children in tow. From our work, we have a choice of Tim Hortons or Second Cup- both are chains, neither are nice. Matt and I discussed locations in huge detail because this sort of venture can only be successful if you get the location absolutely spot on. He made an interesting point – with this sort of business, we needed to stress expertise, quality and local demand over innovation. I’d tried to work quirky things like having a kids corner and selling books into the business plan to try and give us unique selling points, and to make us something more than “just another coffee shop”, but really, it wasn’t necessary. The selling point is our convenient location – very close to a number of offices and a call centre, with no other coffee shop in that area. Of course, being the only person in Saskatchewan, if not Canada, with a Phd in coffee kinda helps too!! We may not be very different, but we can be a LOT better at it. So, we are on track to open in March 2015. Updates will no doubt be coming as we progress, so watch this space! And if you’re feeling extra specially generous and supportive and full of Christmas spirit, then I’ll happily take donations to the cause!